Earlier this month, Joanne won some OPI nail polishes from the gorgeous Nicoletta who decided to try to raise some money for breast cancer awareness month in honour of her mum. Click here to read the beautiful post she wrote about her brave mum. Anyway, I digress. This nail polish does this to me. As I went through our winnings, I saw this one and fell in The Love. I turned the bottle upside down to see what the shade was and was over the moon when I saw it was the much acclaimed Vodka & Caviar from the Russian Collection way back in 2007, so we'll call it a vintage polish rather than old, k? 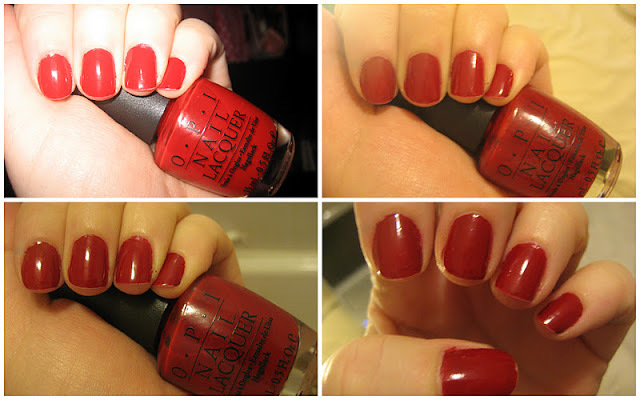 This is the truest red I've ever seen in a nail polish and absolutely stunning. I've gotten so many compliments on it this week and had to share it with you guys. As you know, we turned the clocks back recently for "daylight savings time". Yes, this means I get to go to work when it's dark and by the time I'm home it's nearly dark, fantastic, so no photos of this in natural light, but that's ok. Trust me when I say it is gorgeous. It reminds me of a real old Hollywood red, a Marilyn Munroe red, not a hint of orange to it and not too much of the blue undertones either. It's a creamy, glamourous, vibrant, classic red that has had me showing off my talons since Sunday. Two coats of this glossy jelly polish does the job and topped with Seche Vite, you're good to go. I have some tip wear after two days of solid typing and no chipping so far. Ladies, I think this may be my favourite non-glittery red nail polish ever. Ruby Pumps has my heart when it comes to red glitter polishes in case you were wondering and I will probably give Vodka & Caviar a coat of it tomorrow to extend my manicure. Vodka & Caviar treads that fine line between the more vampy dark red polishes and 1950s pin up bright red. I think you should be able to find Vodka and Caviar on Ebay but if anyone knows where else you can find it, please share in the comments below. I can put my money on it that you will fall in love with this polish ladies. Perfect for winter and Christmas parties. Oh it's gorgeous, congrats on the win! Just had a quick goo on the UK Amazon, and you can get it there too :) I find it hard to get a nice red, they all look really weird on my hands. The daylight issue is a disaster, literally ran outside with a bottle of polish in my hand today like a lunatic to get the last few minutes of daylight! oh HELLO. I need this! Even just for the name! I think Nicoletta is very brave and she really went all out in trying to raise money for cancer. 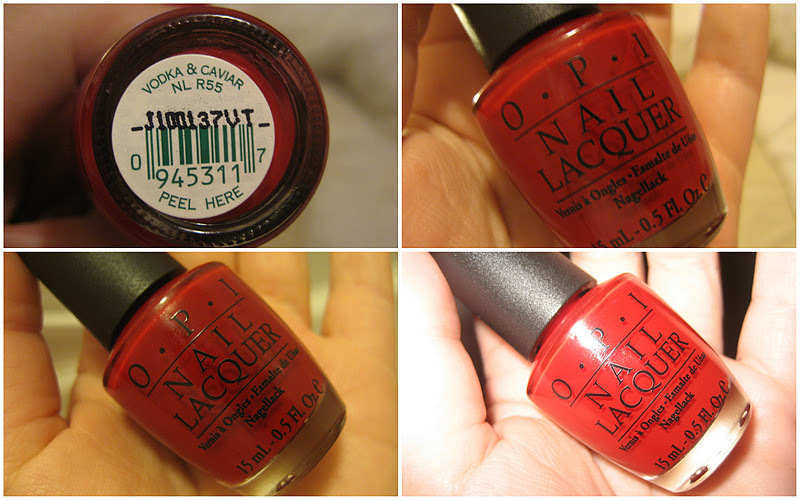 I always get my opi either in Cork, Hennesy Hair Supplies on Pembroke Str or ebay, from beaytyzone2007.